Be the first to share your favorite memory, photo or story of Dorcas. This memorial page is dedicated for family, friends and future generations to celebrate the life of their loved one. 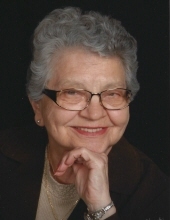 Mullins, Dorcas E. of Southfield went to be with the Lord on Friday, April 5, 2019. She was born on November 15, 1934 in McRoberts, Kentucky to the late Pearl and Harriet Elkins. Beloved wife of Joseph Junior Mullins. Loving mother of Timothy (Karen) Mullins and Melisa (Paul Pietrzyk) Mullins. Caring grandmother of Kathryn and Brendan. She will be dearly missed by many nieces, nephews, relatives and friends. Family gathering will be on Wednesday from 3:00 p.m. until 8:00 p.m. Sawyer Fuller Funeral Home 2125 12 Mile Rd. Berkley. Funeral Thursday 11:00 a.m. Gathering starts at 10:30 a.m. Grace Baptist Church 280 E Lincoln St. Birmingham. Memorial contributions to Alzheimer’s Association. Burial, Lexington Cemetery, Lexington, Kentucky. We decided it would be appropriate to write you all a letter as Mom would if she could. I came to this life the daughter of a coal miner and a steel magnolia – raised in a small coal mining town amongst the hills of Eastern Kentucky, where everyone knew everyone. I was a daddy’s girl and always so proud of him. I ran the sidewalks for Mom’s errands and the hills for my escape - maybe that was the seed of my love for biology and gardening. During my junior high years, mother moved us to Lexington, Kentucky as Daddy’s career moved him from mine to mine. I accepted Christ as my savior as a young woman. As I grew up, I finally became closer to my older sister and brother; though my best friend still had four legs. I recall the fun times of dressing up for special occasions with the Pixie Club, learning to play the saxophone, playing in the Lafayette Marching Band…GO GENERALS!... and realizing other early 1950s American Teen dreams. I developed a love for the Big Band Sound, New Orleans Jazz and Spirituals. After high school, I attended the University of Kentucky and became a teacher…not so much because I “wanted to be teacher” but more because it was the only curriculum that I didn’t have to take humanities – Ha Ha! My first teaching job was in Lexington and I was on my way! Very early on, it was apparent I made the right choice. I loved the middle school and junior high age kids and science. The sparks in their eyes were my delight and drove my efforts while developing a science curriculum. One of colleagues on the development committee was a man named Joe. I was interested, but thought for an entire year that he was married. When it came to both our attention we were both single, we started dating, were joined in Christ, and the rest is, well, history. I continued my education in science education with Joe at my side. I even introduced him as “Joe, my wife”, as all my colleagues were men and it made me laugh. We had two beautiful children and built a life. The backyard was always full of life; a vegetable garden, my colorful flower gardens, dogs, cats, a pony and a lot of kids – all were welcome and there were countless impromptu parties at the pool. It could get crazy, like any summer camp! Through the years, I kept busy teaching, gardening, canning, sewing clothes for my family, quilting and tracing down my genealogy in countless southern court houses with my sister. I am grateful for the relationships I built along the way. Some friends come and then fade from our everyday lives, but never leave our hearts. Distance may usurp our best intentions, but I did do the best I could to make memories and have some fun! My children grew up and made lives of their own; I am proud of them. I loved competing with my son-in-law for “digs” and am forever grateful to my daughter-in-law for my grandchildren – the arrival of which was the biggest joy of my life. Joe and I retired and spent as much time with them as possible. My heart softened as the backyard livened up again. I loved taking pictures of Joe playing with Kate and Brendan in the yard, sharing my love for science in the back yard and lab (kitchen) doing real experiments, taking them to Forever Christmas every year, and putting their poems and art work on any spare wall space. I even learned to use the computer to exercise my boasting rights as a grandmother. Unfortunately, a darkness moved in. Dementia is a horrid disease. It robbed me of my memories and my wit, until my soul was completely locked away from those who knew and loved me. My family thanks God for his hand in finding every one of the caregivers at Brookdale and has gratitude to the nth degree for their love and compassion – every little gesture to preserve my dignity is sincerely appreciated. My family is thankful for everyone’s many kindnesses, expressed through thought, prayer, and deed and is grateful for your presence at the visitation and funeral. I would prefer that you donate to The Alzheimer’s Association than send flowers. Please wear colorful attire if coming to share your memories – you will be my garden. I have gone home now, after a long and rich life. Hope to see you there. To send flowers or a remembrance gift to the family of Dorcas E. Mullins, please visit our Tribute Store. "Email Address" would like to share the life celebration of Dorcas E. Mullins. Click on the "link" to go to share a favorite memory or leave a condolence message for the family.